I am beginning to think the endorphins cause by all the manual labor, mixed with the pleasure of seeing the finished result, has me addicted to DIY projects. The truth might be that these projects are the result of an aging mobile home. Either way, in between heat waves I've been making progress. Our deck is a sad sack made with plywood, rather than nice redwood decking. It was painted white when we moved in four years ago, and had reached the point where hosing it off wasn't getting it clean anymore. The budget is only slightly less sad after the bathroom remodel, so when I saw Valspar Porch Paint in Lowe's a few weeks ago I decided that was the answer, for now. 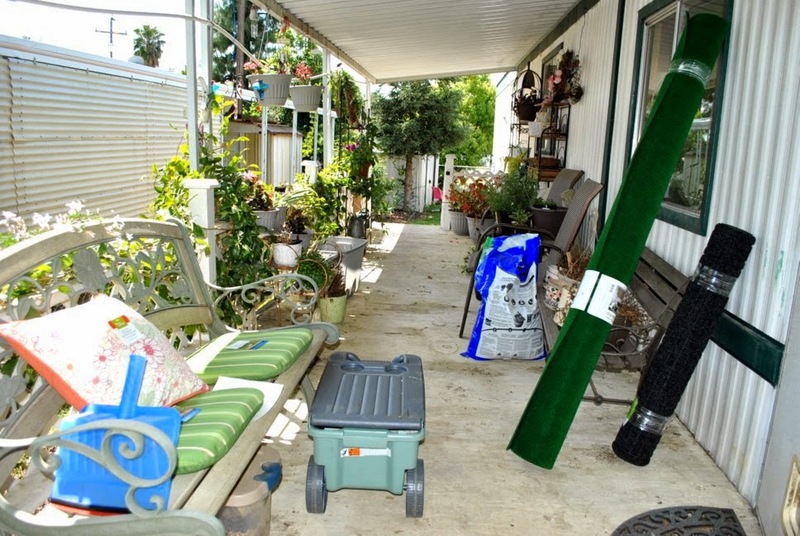 This is the sorry state of the deck top three years ago before I threw down some rugs and cleared off some junk. I chose a grayish-taupe, Weathered Oak, I think they called it. 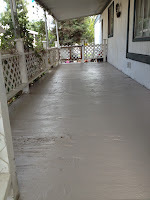 It covered in one coat and a gallon did the whole deck surface! You can see toward the front of the photo how I really need to replace the plywood. 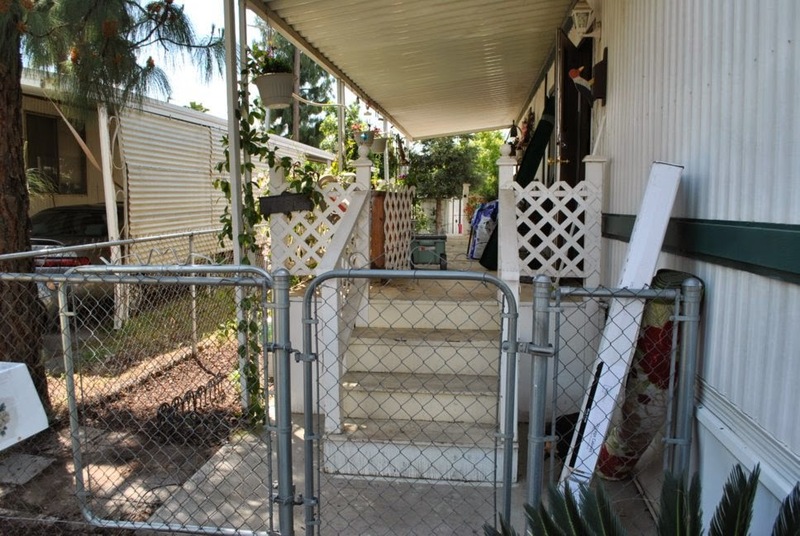 Overall I love the look, but it made the lattice and railing look very tired. 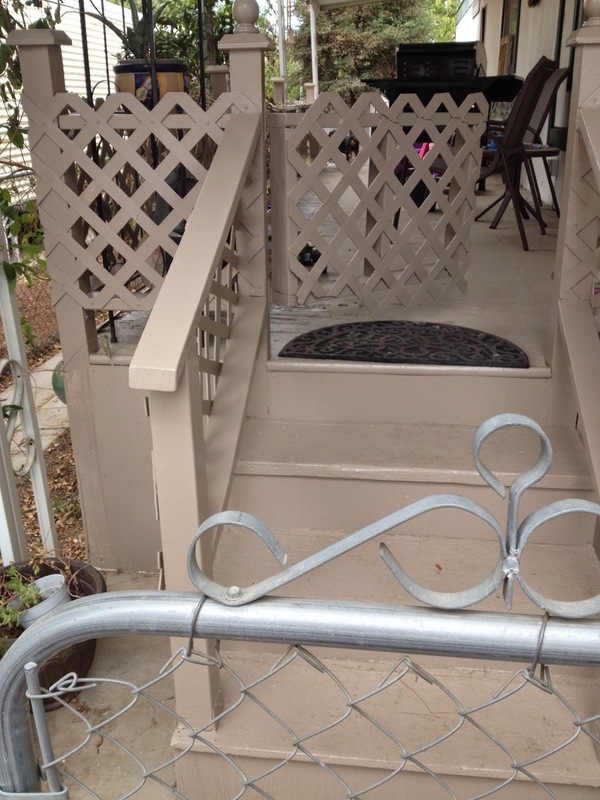 From the front, the lattice and railing didn't look too bad but the steps were in a sad state, and when you're the deck, you can see how the rails weren't getting clean anymore. Lowe's had a booklet of paint colors for the porch paint...yeah, they saw me coming, LOL! I chose a slightly darker coordinating color, Covered Bridge or something like that, and went to town. And I very quickly began to wonder where Huck Finn was when I needed him! I think a sprayer is the way to go for lattice, as the paint brush left drips on the back side of where I would be working, and by the time I finished a section and went to the back, the drips were drying. Let's just say this isn't my best finish. Still, compared to what it was, I am so pleased. I do need to pot some plants if the heat wave doesn't kill them, and get the BBQ back into its spot, but it looks so much better even with things out of place. The next project is laminated flooring in the hall and kitchen. Since the weather outlook shows no end to 100+ degree weather, I will be working early in the day. And you can bet I will have picture to share! 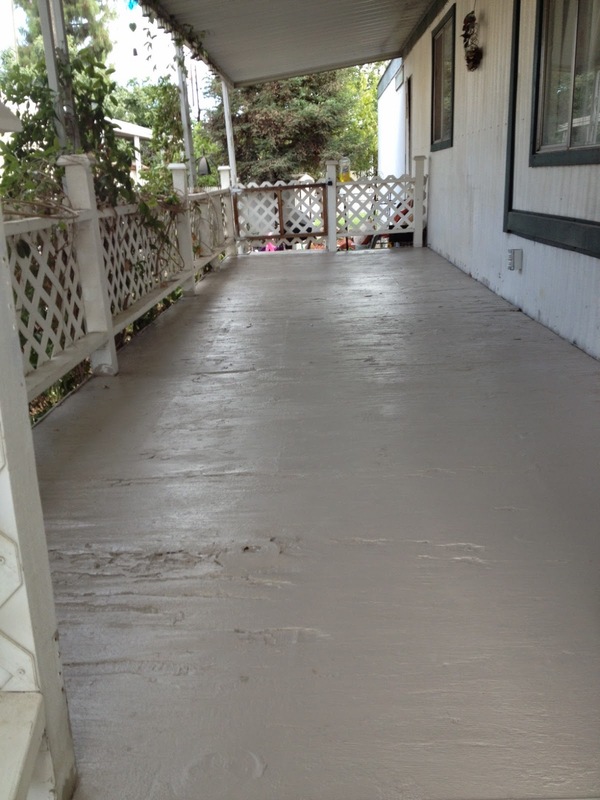 We spent the whole month of June refinishing two decks in between days and days of rain. What a job! Your deck looks great, Aileen. We need to do some external painting as well. Our house is old and much of it is made of stone. But there is an extension on the back that is rendered and painted pink. That needs repainting. It needs cleaning off first. I think hubby plans to get someone in to do it if he can, but it's tough finding a good tradesman. So maybe I'll be wielding a paintbrush soon, or maybe I'll escape. Can't say it's my favorite thing to do. I feel like I should be doing a DIY project just so I can do a post on it!! Love seeing all the pics, Aileen. Aileen, I don't even want to tell you all the stuff my dh is doing this summer! Note I said my dh. I have resigned from my assistant position. Thank heavens he found a teen that likes extra $$! Lyncee, are you really doing it in paper bags? Denise, I think rain is worse for outdoor chores than heat. Helen, I vote for escape, LOL! Lyn, you are so smart to resign! I'm tired just reading about all the work you do. Wanna come to my house next?